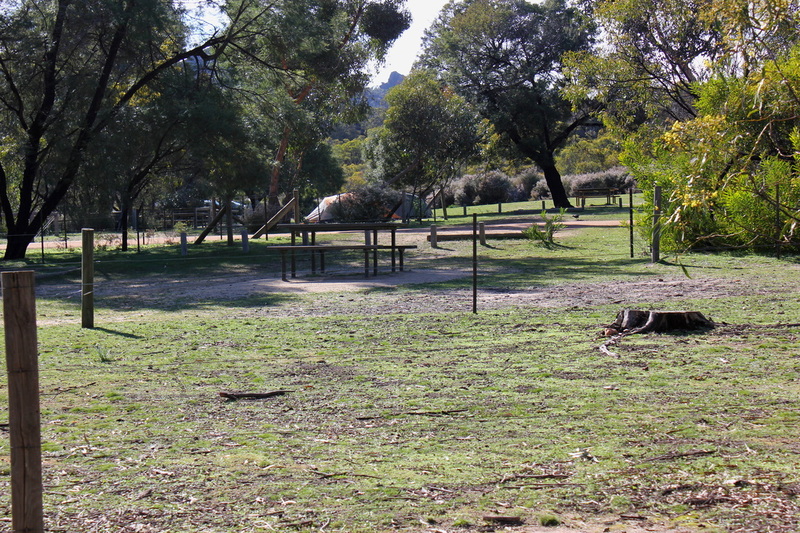 Mt Stapylton campground is the campground closest to Horsham, and located within the beautiful Northern Grampians. After spending time near Halls Gap, this area was noticeably drier, and the surroundings less lush. Please note that this area has had bushfires through it in recent times, so may be closed due to bushfire damage. You will need to check with Parks Victoria if it is open. The following review was done prior to any bushfires in this area. Comprising of 25 campsites, all of which seemed fairly sheltered and with varying amounts of shade. Plenty of tables and benches and firepits are throughout the campground. The campground is in 2 sections - the lower section (with toilets and bush shower) are open and easier access. The top section, small barriers mean that you have to climb over them for camping. The lower section would be the most accessible. As witnessed in most of the campgrounds, there are designated areas for tents (fine gravel plot with a small wooden border). If your tent can fit in that spot, you will be fine. Our larger tent could not, and there are plenty of grassed areas next to this plot. Most people chose to pitch tents on the grass, as the weather was fine. In wet weather the sandy plots helps the water drain better. Campers and caravans will have limited options that suit them. This campground is popular with hikers, climbing the nearby mountains such as Mt Zero and Mt Stapylton. This is a good campsite to use if you are hiking in this area, and need a base. Nearby is the site of significant Aboriginal culture - that of the Gulgurn Manja Shelter (seen to the left) Here you can witness on the rocks Aboriginal art - that of around 26 handprints, and that of the Ngamadjidj Shelter - a short walk from the picnic ground in this area. No drinking water - bring your own. Bush Toilets - male/female and suitable for disabled. There is a water tank for washing hands but in summer it may be dry. It is advisable to not rely on this, and bring all water with you. There is a bush shower as well - but these are not readily suited for disabled. The doors are on a tight spring and difficult to push, and inside its very small and narrow. Camping permits are required and available in Halls Gap which is a fair distance away, so call for a permit. Permits are available at Brambuk the National Park & Cultural Centre in Halls Gap or by credit card by phoning the Centre on (03) 5361 4000. Office hours are 9:00am - 5:00pm daily (except for Christmas day).